Reining is a pattern class and each horse and rider are judged on the accuracy of the pattern, to be completed from memory. 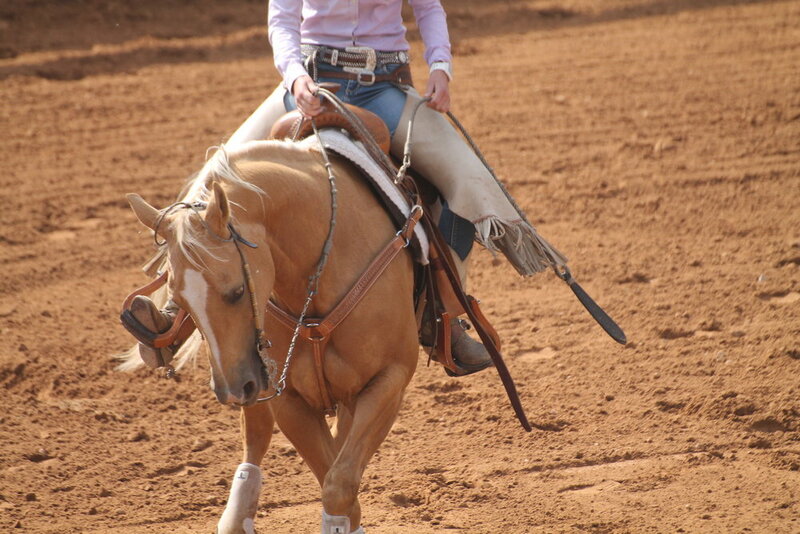 The National Reining Horse Association have 10 patterns and AQHA events have 11 patterns. Reining is often described as the western form of dressage as it requires the horse and rider to be in tune with each other in order to perform the movements, without the rider aids being seen. Reining originates from cattle work as the work required responsive horses that could change direction quickly and “stop on a dime”. These horses needed to be ridden with leg aids and weight and only a light rein so that the cowboy’s attentions could be on the task at hand. Each pattern includes the following manoeuvres, which the horse and rider should must perform smoothly and accurately, which includes controlling speed. The horse should turn around a full 360 with the inside hind leg stationary, in other words pivot around the inside hind leg. Spins are judged on correctness, smoothness and cadence. To complete a flying change, the horse switch the leading front and hind legs during the lope during the moment of suspension in the lope gait. The transition is judged on precision; early or late changes will have points deducted. Circles should be perfectly round and the change of pace between small slow circles and large fast circles should be without any difficulty. Without hesitation, the horse will perform a 180 turn after a sliding stop and immediately lope off (on the correct lead). The horse stops by driving his hocks underneath him and sliding on his hind feet, while the front legs continue to walk. The stop should be in a straight line. Before a sliding stop is the ‘rundown,’ this is where the horse runs along the side of the arena building up speed before the stop. Back up quickly, but in a straight line for at least 10 feet. Judged on speed, smoothness and straightness. Each riders starts the pattern with a score of 70, the judge will then either add or subtract points for each manoeuvre, the points range from -1.5 to +1.5. A final score of 70 is a good score and one that reiners aspire to achieve. A manoeuvre that is correct, with no degree of difficulty, will nether gain or lose points. For protection, horses usually wear splint boots on the front legs and skid boots on the back. Reining horses often have special horseshoes known as sliders, these shoes have wider plates which are smoother than regular shoes. Riders must wear a long-sleeved shirt, jeans, and cowboy boots. In most competitions, they also wear chaps.